of hedge funds, private equity, and real estate managers. JASON A. SCHARFMAN is a Director with Graystone Research at Morgan Stanley. His responsibilities include analyzing and reporting on the operational risks of alternative investments such as hedge funds, funds of hedge funds, and private equity considered for investment. He also makes recommendations to the firm's investment committee based on that analysis. He has written on the subject of operational due diligence and travels and speaks worldwide on hedge fund operational risks. Chapter 1. What is Operational Risk? Modern Definition of Operational Risk in a Hedge Fund Context. Operational Due Diligence versus Operational Risk. Chapter 2. The Importance of Operational Due Diligence. Why Should Investors Care About Operational Risk? Morton's Fork Or A Hobson's Choice? Hedge Fund Fraud Cannot Be Modeled. Each Hedge Fund Is Different. Ability To Generate An Informational Edge. Potential To Reduce Losses And Increase Returns. Considering Operational Risk Factors Presents A Different View Into A Firm. Other Considerations: There Is Not Necessarily A Positive Correlation Between Assets And Operational Quality. A Study In Operational Failure: Bayou Hedge Fund Group. Large Discrepancies Between The Performance Of Onshore And Offshore Funds. Declining Capital Of Broker Dealer. Board Of Directors: Members And Actions. Fake Audits Prepared By A Phony Auditor. Ties To People Barred From The Securities Industry. Revision Of Conflicted Marketing Materials. 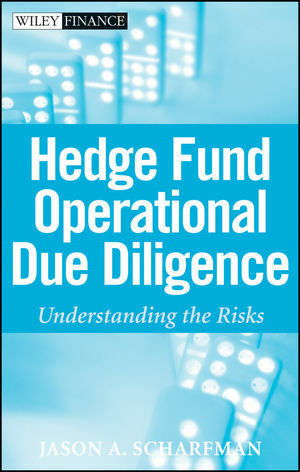 Chapter 3. Who Is Qualified To Perform An Operational Due Diligence Review? Primary, Secondary, Blended, And Other Skills. Evolution Of Independent Operational Rating Agencies. Benefits Of Third-Party Rating Agencies. Criticisms Of Third-Party Rating Agencies. Factors To Consider Before Performing An Operational Review Of A Hedge Fund. Chapter 4. Creating An Initial Operational Profile. When Does An Operational Due Diligence Review Begin. Due Diligence Questionnaire: To Use Or Not To Use? What Topics Should I Cover During An On-Site Review? In What Order Should These Topics Be Covered? Qualitative Operational Report: Documenting The Operational Data. Chapter 5. Evaluating the Gray Areas: Examples. Scenario 1: It Was Not Me–Hedge Fund Manager Claims It Is Mistaken Identity. Scenario 2: It Was Me But, Everyone Was Doing It–Are Regulatory Witch Hunts Real? Scenario 3: It Was Me But, I Did Nothing Wrong--Manager Proved Not Guilty. Scenario 4: The Low Profile Hedge Fund Manager–Is No News Good News? Scenario 5: The Infrastructure Outsourcer–Can An Administrator Do Everything? Scenario 6: The Mountain Climber – Can Plans For Large Fast Growth Trip You Along The Way? Scenario 7: The Stumbling Giant–Can A Large Manager Lose Sight Of Small Controls? Scenario 8: The Apologetic Headmaster–Are Junior Staff As Informed As Senior Management? Chapter 6. Ten Tips When Performing an Operational Due Diligence Review. Tip 1. Meeting With The Wrong People Or The Wrong Groups. Tip 2. Get Out Of The Conference Room. Tip 3. Little White Lies Can Turn Into Big Problems. Tip 4. Be Wary Of Phantomware. Tip 5. Focus On Documentation And Negotiation. Tip 6. Read The Fine Print (Financial Statement Notes Etc.). Tip 7. Reference Checking: The Importance Of In-Sample And Out Of Sample References. Tip 8. Credit Analysis: Are Funds Financially Viable? Tip 9. Long-Term Planning: Key Staff Retention, Succession Planning, And More. Tip 10. Growth Planning: Is The Manager Pro-Active Or Reactive?? Chapter 7. On-going Operational Profile Monitoring. How Often Should Background Investigations Be Renewed? Remote Operational Due Diligence Monitoring. Assets Under Management And Performance Monitoring. Effect Of Discovery On The Magnitude Of An Operational Event. On-Site Visit Frequent And Operational Events. Multi-Jurisdictional And Intra-Jurisdictional Regulatory Coordination. Chapter 8. Techniques For Modeling Operational Risk. Building a Scoring System: Category Determination. Category Definitions: Combinations of Approaches. Category Weight Consistency and Re-weighting Considerations. Category Scale Determination and The Meaning of Scores. Score Aggregation: Sum Totaling and Weighted Averages. Chapter 9. Bridging the Gap: Incorporating Operational Risk Consideration Into the Portfolio Construction and Asset Allocation Process. Pro-Active Monitoring: Graphical Universe Creation. Pro-Active Management Of Operational Risks. Protecting Against Conglomeration Risks: Multivariate Commonality Analysis. Example Of Multivariate Commonality Analysis. First Objective: Total Diversity Goal. Second Objective: FSA Overweight Goal. Third Objective: FSA Underweight Goal. Considering Operational Reviews In The Hedge Fund Portfolio Rebalancing Process. Can Operational Risk Be Entirely Eliminated? Factoring Operational Risk Into Total Risk Calculations. Beyond Scorecard Approaches: Discounting Expected Return. Discounted Expected Returns With The Operational Factor. Expected Return And Operational Risk. Shape Of The Expected Return Versus Operational Risk Curve. Chapter 10. Looking Ahead: Trends in the Space. Commoditization Of Background Investigations And Canned Operational Due Diligence Reports. Increased Reliance On Service Provider Consulting Services. Capturing Of Hedge Funds By Service Providers And Employees. Hedge Fund Pursuit Of Audit Certifications. AU 332 And FAS 157. Development Of Hedges To Operational Risks. Links Between Operational Risk And Credit Analysis. Proposed Re-Regulation Of The Hedge Fund Industry.